Cambodia National Rescue Party lawmaker Men Sothavarin was a no-show in court yesterday, the latest instance of a party member citing a busy work schedule in spite of a summons over a violent political protest in July of last year. Speaking by phone from his provincial constituency in Kampong Thom, Sothavarin said that in addition to fulfilling his duties as a lawmaker, he is baffled as to why he was even summonsed in the first place. He added that he will not appear in court as long his parliamentary immunity remains intact. Yesterday, his lawyer Sam Sokong took the reigns. He confirmed that he appeared in court, telling presiding judge Keo Mony that his client was working and therefore could not make an appearance. Sothavarin is among seven CNRP lawmakers charged with inciting an “insurrection” on July 15 of last year, following a demonstration that turned violent in the aftermath of the disputed 2013 general election. In addition to Sothavarin, lawmakers Mu Sochua, Ho Vann, Keo Phirum, Real Camerin, Nuth Rumduol and Long Ry have been summonsed by the court over the protest. 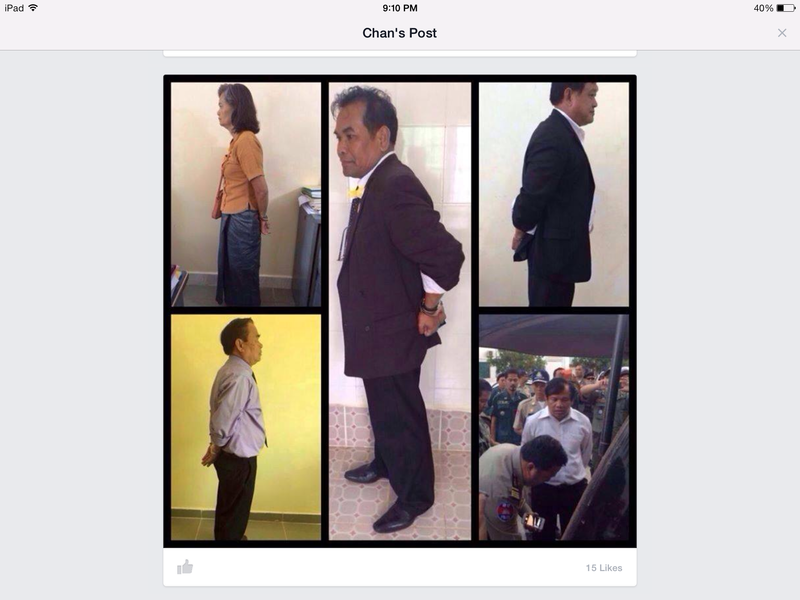 Five have already been called to court, but only Mu Sochua has appeared for questioning. When asked why she showed up, Sochua said she wanted to ask the court if they were familiar with the constitution. As for her colleagues, Sochua maintained they had “other things to do”. Nuth Rumduod is scheduled to appear today, while Long Ry is penciled in for Friday. BANGKOK, 29 May — Parliamentarians from ASEAN member states, including Thailand, Malaysia, Indonesia and Myanmar expressed serious concern today after a meeting on irregular migration in Southeast Asia failed to address in any meaningful way the root causes of the region’s migrant crisis. Lawmakers from ASEAN Parliamentarians for Human Rights (APHR) said they were dismayed and disappointed that representatives from ASEAN member states failed to publicly discuss the persecution of the Rohingya, shamefully bowing to pressures from a military government directly responsible for some of the most shocking and heinous policies of persecution in the world today. “It’s just another case of ASEAN doing as ASEAN does: lots of talk with little genuine substance or resolve to take any action whatsoever on the root causes of this crisis,” said Charles Santiago, Chairperson of APHR and Malaysian Member of Parliament. “The meeting’s failure to openly discuss the desperate conditions and systematic human rights violations suffered by the Rohingya population is tantamount to complicity in the crimes being committed against them. A country responsible for human rights violations cannot just veto any discussion of them in an open meeting. “Myanmar’s policies are aimed at ‘cleansing’ the country of the Rohingya population, pure and simple: the government even admits to it itself. Can we really allow them to dictate that we can’t talk about it? Calling it an elephant in the room doesn’t even begin to do it justice,” Santiago added. Results from Myanmar’s recent national census sends a clear signal of how the government there views the minority, APHR said. The results, released today, did not include details on any of the estimated 1.1 million Rohingya, with census takers refusing to count anyone who identified themselves as such. APHR reiterated its calls for Malaysia to urgently convene an Emergency ASEAN Summit to resolve the Rohingya issue and wider problem of human trafficking at the highest levels of government and come up with binding agreements to address the problems. It’s crystal clear what we need to deal with and address here – and the majority of it is down to what is happening in Myanmar, APHR said. If ASEAN can’t even talk about it let alone agree on a plan of action, then there is exactly zero chance of any long-term solution, APHR warned. The issues at stake include: state-sponsored persecution and systematic human rights violations of the Rohingya; violence and hatred being fostered between Buddhist and Muslim communities in Myanmar; some 140,000 mostly Rohingya internally displaced and being held in squalid camps in Rakhine State, while others are segregated in racially divided ghettos; and ASEAN member states denying the right to asylum of tens of thousands of Rohingya risking their lives fleeing intolerable conditions; as well as a regional failure to tackle international people smuggling and human trafficking gangs operating in alliance with state officers. Media reports on Friday suggested Malaysia was seeking to organize another government-level meeting with representatives from Thailand, Indonesia, Malaysia and Myanmar. However, APHR stressed that this was an issue that all the governments of ASEAN and relevant nations such as Bangladesh must be involved in addressing. “The crimes taking place against the Rohingya in Myanmar are edging closer and closer towards crimes against humanity, with the government enacting legislation aimed at limiting births, segregating communities and fueling hatred and violence against the Rohingya as well as the wider Muslim community in Myanmar,” Santiago said. “The fact that ASEAN is refusing or failing to confront this looming catastrophe threatens the very fabric of the grouping itself. The Rohingya crisis is a threat to the security and stability of the entire region and must be confronted in a unified way by ASEAN,” Santiago added. I intend to take up this case. While in prison myself, I heard to. Many stories of women who have not told their children where they are: shame and not being able to pay the visiting fees. Yong Han’s head was found floating in a lake three months after his decapitation. The 49-year-old fisherman was killed for being a “sorcerer” in November 2013, his head hacked off with a machete, police said. Naim Vanny, 42, was one of the three men charged over the murder. 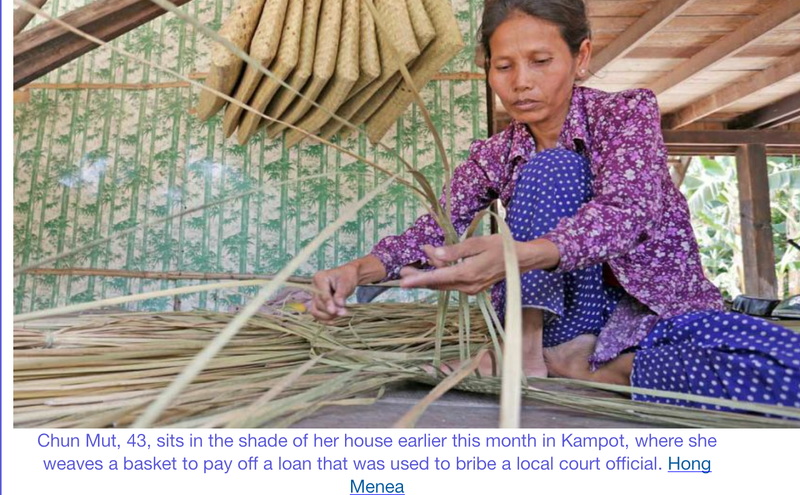 His wife, Chun Mut, 43, now weaves baskets all day to save enough money to pay off thousands of dollars of debt she says she owes after borrowing money to bribe local court officials to secure her husband’s release. Yet he still remains behind bars. Interviews with those involved in the alleged payoff and an investigation by a local rights group support the claims of the suspects’ wives that court officials – including one who was a relative – pocketed about $18,000 while failing to deliver on the promised reprieves. 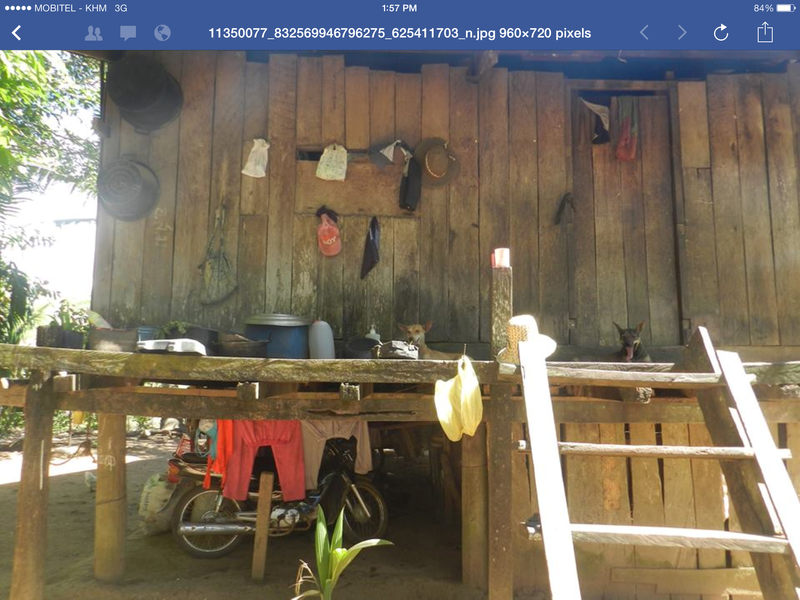 Mut’s family once owned cattle and farmland in Kampong Trach district’s Sala Kang Tbong commune. Her three children went to school like the other kids in the village. Now, more than a year after Vanny’s arrest, everything has changed. 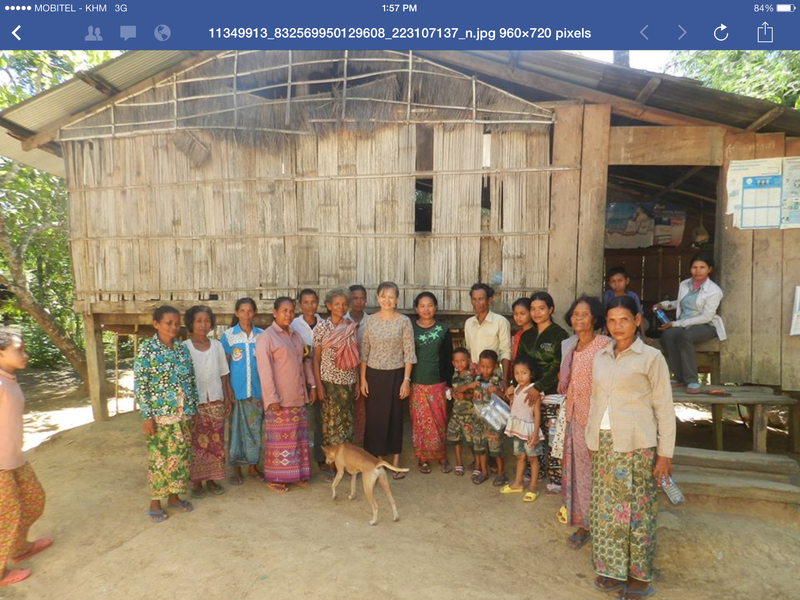 Mut’s house lies off a dusty track in Koh Chamka village, its broken walls and open roof a testament to the continuing cost of her debts. 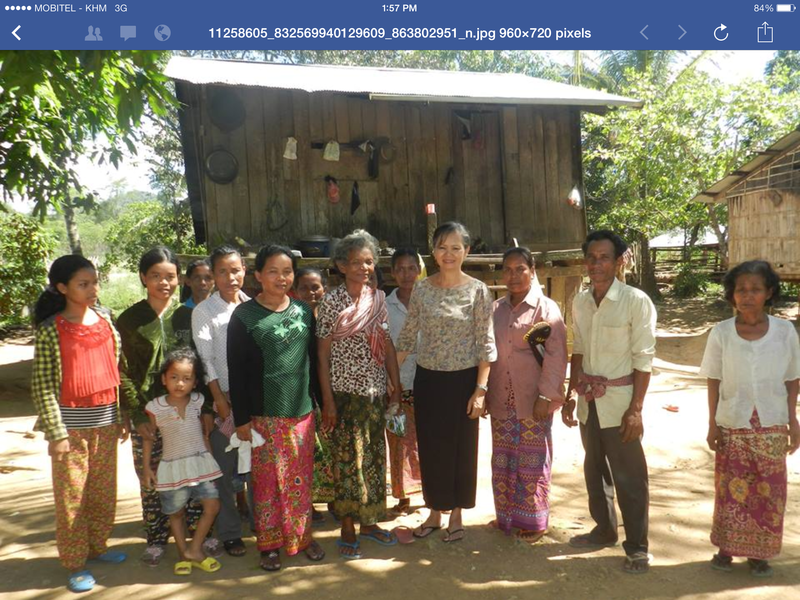 Along with the wives of the other two men arrested for the crime – Ing Siv and Bun Sara – Mut approached provincial court official Prom Mony, Siv’s uncle, hoping to secure the suspects’ freedom for a price. Between them, they managed to take out loans and sell enough property to drum up the $18,000 they allege Mony requested. Mony denies receiving the money, saying he only put them in touch with a lawyer, Pov Sreysuor, and telling them he “could not do it as I was about to retire”. Sreysuor, meanwhile, says he only took a “legal fee” of $600 to officiate the arrangement. To make the alleged payment, Mut says she borrowed $1,500 from a loan shark and sold a rice field she owned for $2,500. Two buffalos brought in another $2,500. Siv and Sara told similar stories of their attempts to secure enough money to pay the bribe. “We are rural people, so you can understand we don’t have thousands of dollars lying around. We sold our property because we have nothing else. We went to his [Mony’s] home many times to give him the $6,000 each he wanted,” Mut alleged. To sweeten the deal, the women brought Mony’s favourite foods: ducks, chickens and four dogs. After handing over the $18,000 in a series of seven payments, the women say they were shocked to learn that their husbands had each been handed 21-year sentences. “I spent a lot of money to get him out. He’s innocent. If he was mean-spirited, I would not have tried to help him,” Mut said in a flood of tears. Police said a fourth, unknown suspect had not been caught; villagers say it is because he is related to a local police official. The sentencing of the three men has led Mut’s children to drop out of school after being bullied by their classmates. Mut alleges that while in police custody, Vanny was beaten unconscious numerous times in a bid to solicit a confession, but he would not give in. Police yesterday denied her claim. “We did not hit him to get a confession. His wife just accused us to help set him free. We thoroughly investigated the case, but not with our fists,” said Mao Chan Makthurith, deputy provincial police chief. While in prison, Mut says she visited Vanny more than once a week to treat the injuries suffered under interrogation, paying a $5 bribe to the prison guards each time. Though Vanny had a chance to flee, he stayed in the village to face the charges, she said. Mony lives in a large villa in Kampot town, surrounded by gardens filled with fruit trees. He denied the women’s claims that he cheated them. “They paid about $18,000, but they did not give it to me. I helped them find a lawyer. They handed over the money to the attorney so he would contact the court. I know nothing,” he said. Mony retired in February last year, the same month that Han’s head was discovered floating in the lake. He admits he gave each of the women about $3,000, but not to repay a bribe, rather because he “pitied those women, who are very poor”. Mony’s 48-year-old niece, Siv, also now weaves baskets in the village to pay off her debts, making about $7 per day. “I gave the money to Uncle Mony, but he tried to hit me when we asked for it back. 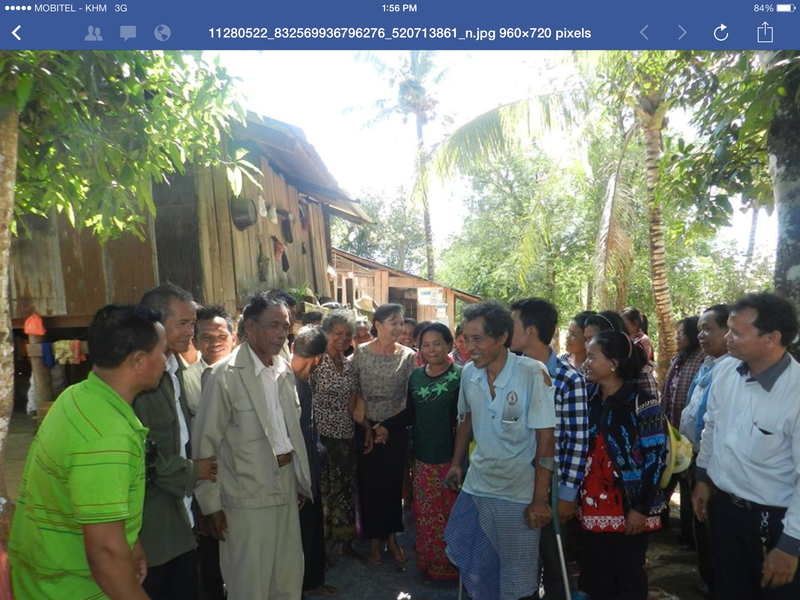 Sometimes we slept outside in Kampot to ask him again the next day,” she said. 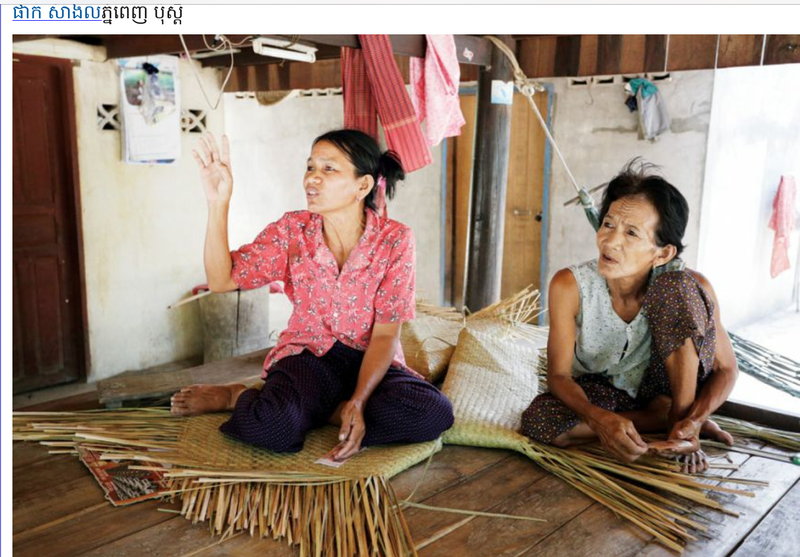 An investigation by local rights group Licadho into the case concluded the women’s stories to be true, the group’s provincial coordinator, Yem Phally, said. “It is a clear case of corruption, because the court officials told them to pay to get their husbands released. It was so much money for rural people. I’ve never come across such a case before,” he said. Commune council member Vann Bora also supports the women’s accounts. The women claimed they did not know offering such payments was illegal, as they had heard of many cases where releases had been secured in a similar fashion. Mut is now penniless and has not been able to afford the fees to visit her husband in prison for the past two months. “The rural people are not experienced with this kind of corruption. The responsibility lies with the recipient; he is the one who knows the laws and should be held to account. Our investigation showed the lawyer, Sreysuor, was involved [along with Mony],” Phally said. Cambodia is consistently ranked towards the bottom of corruption indexes, and last September, a Transparency International report rated the judiciary as the country’s weakest institution. While the women have filed a complaint at the provincial level with the Anti-Corruption Unit, deputy ACU chief Kheang Seang yesterday said he was unaware of the case due to the number of active cases currently under investigation. They have list thousands of community land to a company. It has taken us two years to gain their confidence. We got into the community last week. They live in total fear of the local authorities in this former KR stronghold. I will find out which company and how they got authorization to be in the community and elsewhere in Samlot. My face, my name, my body have been abused by critics more than once. The cut and pace done by some ill- minded critics is so obvious that is not worth wasting our time. Best is to push the Delete button. What Do Australians Think About Their PM? A lot has been written in recent weeks about the Rohingya. And with good reason. They are among the most persecuted people in the world. A Muslim ethnic minority living in Myanmar for generations, they aren’t allowed passports or citizenship. Their movements are restricted. They can’t marry. Thousands have been forcibly moved to militarized ghettos in Myanmar. 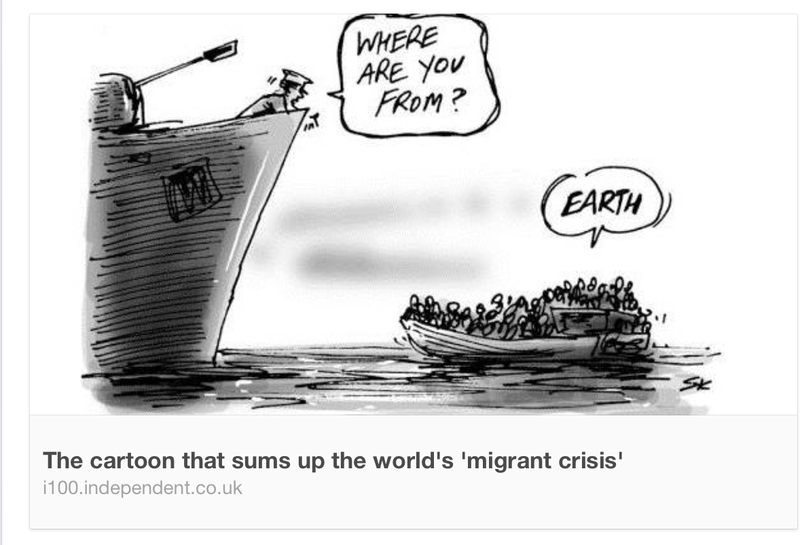 Of those who escape, many die at sea of thirst and hunger as country after country refuses to let them land. Some make it to Thailand where they are tortured and extorted by human smugglers or left for dead in jungle camps. It can’t get worse. But all the media attention is finally leading to some action. Indonesia and Malaysia have agreed to let boats full of thousands of Rohingya land on their shores. They will give them temporary shelter, but only for a year. Then they have to find a third country to resettle in. That country could be the United States, reports GlobalPost Senior Correspondent Patrick Winn. It has offered to take the lead on a multi-country effort, organized by the United Nations, to resettle the most desperate of the Rohingya. Meanwhile, it says it will put pressure on Myanmar to end the apartheid-like conditions. Abbott seems to think that the Rohingya should amble on down to the Australian embassy in Yangon, present all the necessary IDs and fill out all the correct paperwork to begin the process of obtaining some kind of visa to legally enter Australia. Then they should board a plane and fly to whatever Australian city they choose. Once there, they can freely start the fairy-tale life they’ve so viciously been denied for so many decades. A new beginning- one of the results of months street protest and the culture of dialogue. PHNOM PENH (The Cambodia Herald) — The European Union is committed to helping the election reform in Cambodia, said Sik Bunhok, president of the National Election Committee. The remark made known after a meeting with a delegation of the EU led by Silvio Gonzato, Director for Human Rights and Democracy at the European External Action Service which discussed on the preparation of new voter lists for commune election and general election to be held in 2017 and 2018, respectively. 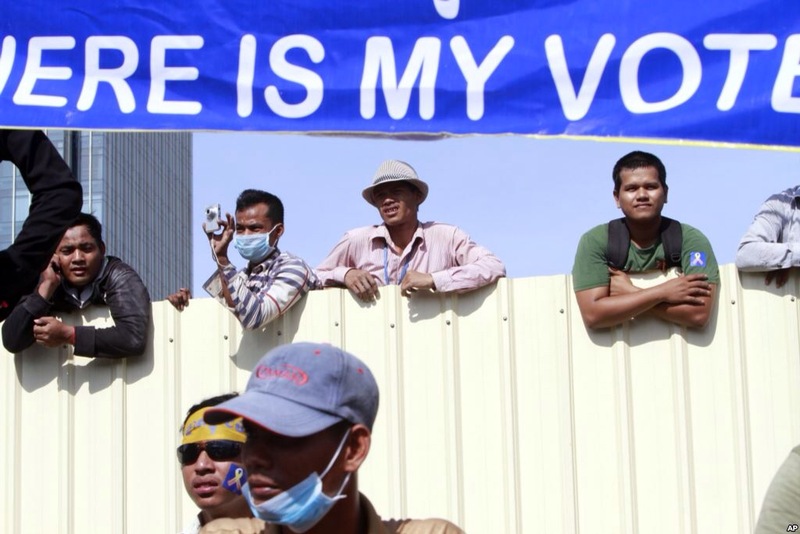 “The EU is committed to helping the elections in Cambodia to make it better in the future. Its experts will work directly with NEC’s experts in order to help the preparation of voter registration,” he told reporters. According to NEC’s President, NEC really wants EU to help in voter registration and new voters’ list elaboration process as well as educating the voters to know their rights. The NEC will launch the new registration by modern technology in2015, and will prepare the new voter lists in early 2016 for the commune elections.